Early Thursday morning two guys were allegedly stealing street signs in the vicinity of Strathmore Road and Lothian Road in Brighton. When the police arrived, the two guys were holding street signs and one had a wrench in his pocket. When the guy said that they didn't have to hand over the wrench to the police, the cops arrested them and took the wrench away. Oh, and the police used the wrench to re-attach one of two removed signs. Image of signs by Birger Hoppe provided through a Creative Commons license. Boston College completed the final portion of the purchase of the St. John's Seminary lands and buildings (except for St. John's Hall) from the Archdiocese of Boston in August 2007 for $65 million. Where did the actual cash for that transaction come from? At Tuesday night's meeting of the BC Task Force, while discussing a broader issue of the credit crunch and how it might apply to the 10-year construction plan BC has proposed, I made a statement that BC was given authority in August 2007 to issue $177 million in tax-exempt bonds, some of which was to go to the purchase of that property from the Archdiocese. I didn't think it was a controversial statement. BC's Director of Public Affairs, Jack Dunn, strongly disagreed, saying that "the notion that BC used public money to purchase the archdiocese land is inaccurate." In so doing, Dunn made a statement in direct contradiction with one from the Massachusetts Development Finance Agency ("MassDevelopment"). The school will use proceeds from a tax-exempt bond to finance several construction projects and purchase 18 acres of land and buildings from the Roman Catholic Archdiocese’s former Brighton headquarters. Projects include the construction of three new academic buildings, a recreation complex and student center on the school’s Chestnut Hill campus. Sounds rather declarative to me. What's more, the press release, issued on MassDevelopment letterhead, listed two contacts for further information: Alicia Tildsley of MassDevelopment; and Jack Dunn of BC. Dunn's name was right on the top of the release. The difference between Dunn's statement and the MassDevelopment press release raises the question: Did BC actually spend the money from the bonds in the way that MassDevelopment last year thought they would spend it? Image of tax-exempt bonds by Paul Levy at the Running a Hospital blog. Boston's Chief City Planner, Kairos Shen, ventured out to Brighton for the first time to meet with neighborhood residents on the topic of Boston College's Institutional Master Plan. The university and neighborhood are locked in a battle over a proposed undergraduate housing plan which would put dormitories with 500 students on the former St. John's Seminary land (BC's new "Brighton Campus") -- as well as convert the newly-purchased apartment building at 2000 Commonwealth Avenue into an undergraduate, off-campus dormitory. In a written letter, the BC Task Force, a Mayoral-appointed community group advising the BRA, called for revisions in BC's proposals to relocate the Brighton Dorms onto BC's main campus. Shen proposed a possible solution to the master plan approval process -- which was akin to floating a trial balloon with neighborhood residents -- with the intention of breaking the logjam. Shen was so smooth and polished, it took two hours for the residents to figure out that he was proposing basically to give BC every single thing they proposed in their master plan. Well, everything except for 350 of the 500 beds of housing on the Brighton Campus -- but those 350 might still end up exactly where BC wants them. For the most part, residents didn't seem to like what they heard, with comments that became increasingly concerned as the meeting went on and they realized what was in Shen's proposal. Shen promised to attend next week's meeting of the BC Task Force. I suspect he will hear an increasingly animated and negative crowd unless he shows up with a modified proposal that better addresses the Brighton Dorms and 2000 Comm Ave.
Shen said that his mandate from Mayor Thomas Menino was to "see if there are certain elements of this [master] plan that can be advanced." He broke up the master plan into projects which were mostly non-confrontational and could potentially be approved in the first phase of the master plan (although with modest modifications). More controversial projects would be put off into a second (or subsequent) phase, which would like entail one or more IMP amendments being proposed during the 10-year time period. He listed those projects that he thought could go forward: parking expansion of Beacon Street Garage (next to football stadium); Shea Field Dorms; More Hall Dorms; Recreation Center; Brighton Fields (baseball and softball stadiums and intramural field); approval of a dormitory at 2000 Comm Ave; and Brighton Fields Garage (which may need modification to "minimize impact on the landscape"). On the hot-button issue of the Brighton Dorms on the St. John's Seminary site, Shen said "we feel that needs to be taken off the table." The room broke into applause. The audience applause was short-lived when Shen then back-tracked to say that "we feel like the 150 [beds in the Comm Ave dorm] has the potential of being more approve-able... with the right kind [of design]... but the 350 [beds at the interior site] we don't believe" can be approved. The 150 bed dormitory, sited on a granite out-cropping on the southern side of the seminary land site, was only off-the-table for about ten seconds. "I believe this [scoping determination] needs to be expanded to deal with these last 350" beds, meaning that alternative siting would be considered. The idea would be to test some of the ideas about dorm location and design using testable metrics on buildings constructing in the first phase of the plan. The results would indicate where the 350 beds would go. Shen admitted that BC might well come back in several years and re-propose putting the 350 beds at the exact same site, anyway. He hypothesized that conditions might change within a few years, much as they changed when 2000 Comm Ave hit the real estate market, to create a game-changer that could provide an alternate site. Giving BC the Whole "Enchilada"
There appeared to be a cognitive dissonance between Shen's trial balloon and his claim that "you're not being asked to eat the whole enchilada." It's no wonder that Thomas Keady, Jr., Vice President for Governmental and Community Affairs at BC, said at the end of the meeting that "we found this meeting positive and headed in the right direction." Leland Webster, a supporter of BC's proposal to construct dorms on the Brighton Campus as part of a 100% housing solution, didn't take to Shen's solution. "[The] 150 [bed] plan includes the possibility that 350 [students] could be left [living] in the neighborhood," Webster said. "[In the] final anaysis, it's got to be 100%." BC's master plan inherently has a domino effect between athletics facilities, the recreation center, and undergraduate housing. Furthermore, [the solution to 500 beds on the Brighton Campus] may require additional stories on the More Hall site... the Mods site... a [new] building on the other side of the Mods site that they are not proposing to develop... more stories on the Shea Field site... revisiting renovating (or replacing on-site) Edmonds Hall. I think you are violating your own... city planning principles here by taking a piecemeal approach to what is fundamentally a master plan process to last for ten years. And I think that it's going to make everyone here come back a year from now, three years from now, five years from now, eight years from now, and fight the exact same battles again and again. I think that you should solve the [undergraduate] housing problem, and solve it now. Maria Rodriguez expressed the same sentiment: "Does [this proposal] mean that we will have to mobilize again" in five years? A resident asked if Shen could produce a written document that the neighborhood could study in order to evaluate, and Shen said he would create one. The trial balloon was not only Shen's way of trying to free the review process from the logjam, but also to fast-track city approval of it. He let drop that they could conceivably go to the BRA Board on September 25th to ask for an October 16th public hearing and decision on the master plan. Several comments were made that this sounded like a rushed process. From what I heard spoken Tuesday night there was no widespread acceptance of Shen's trial balloon, so his ambitious timetable appears unworkable. Tuesday night's meeting took place only four days -- only two working days -- after the close of the public comment period on BC's revised IMP filing with the city. The BC Task Force's comment letter was likewise dated Friday. Shen was asked several times if the city considered all the public comments, particularly the task force's letter, in arriving tonight's proposal he presented. At first Shen pointed out that "many of the elements in the [task force's] letter were what we were already considering." "I'm a little troubled that [4 days later] we're being asked to consider compromise," said Daina Selvig. What follows now "must be a much more robust and open" process than the one that appears to have transpired. "There has not been sufficient consideration" of the public comments and task force's letter, said Sandy Furman. But Shen went on to describe all the people with whom he had been working behind the scenes. He had met not just city officials from various departments and repeatedly mentioned the Mayor, but Shen also appears to have met with every BC official from stem-to-stern -- including a meeting with the President of BC, Fr. William Leahy, S. J., that Mayor Thomas Menino also attended. Yet this was Shen's first meeting with Brighton residents. And, he admitted, he had not met once with the task force. In a world where developers, architects, community activists, and politicians almost never agree on details, Shen has managed to earn a reputation as an intelligent, thoughtful, creative visionary with a knack for crafting compromise where once dwelled only conflict, animosity, and great gnashing of teeth. His considerable polish and smooth presentation was on vivid display Tuesday night. Said one attendee afterwards, "[Chen's] a lot better politician than a lot of the guys in the back [of the room] here." If you thought that city planners were dry and boring, then Shen will change your view. While he took questions Tuesday night, most of the time was devoted to his presentation of the trial balloon. Issues of planning principles were mentioned here and there, but the presentation really was a strong sales pitch from someone who could easily run for elected office. Mayor Menino has previously and repeatedly expressed his opposition to all 500 beds in both dorms, so this dance proposing approval of the 150-bed dormitory was a political two-step. He sent one of his best salesmen to pitch the idea, but it's not an easy sell. But Shen did have everybody going there, if just for an hour or so. It will be harder to understand how the Mayor will explain his potential flip-flop on this controversial neighborhood issue. What's the difference between two dorms and a 150-bed dorm plus maybe 350-bed dorm? Lipstick. Next meeting of the BC Task Force: Tuesday, September 16th, at 6:30 pm at the Brighton Marine Health Center. Image of Oneonta Gorge, Logjam by Squash713, of balloon by OpenThreads, of enchilada by hackett, and of steamroller by Tellstar_Logistics, all provided through a Creative Commons license. The BC Task Force released their letter dated September 5, 2008 addressed to the Boston Redevelopment Authority on Boston College's revised Institutional Master Plan. You can find it at the AllstonBrighton2006 (AB2006) Google Group. A community task force reviewing Boston College's proposed expansion is urging city officials to seek "substantial modifications" to the plan and require a 10-year moratorium on expansion into the Allston-Brighton neighborhood. In a strongly worded 17-page letter received Monday, the Allston-Brighton advisory group cited a range of concerns about the $1 billion campaign's impact on the neighborhood. It voiced opposition to the university's plan to build dormitories for 500 undergraduates on its Brighton campus, the former headquarters of the Roman Catholic Archdiocese of Boston. Instead, it urged the college to house those students on the college's main Chestnut Hill campus and called for a 10-year moratorium on expansion to "safeguard Allston-Brighton's residential character." The panel asked city officials to deny the college a permit to convert a high-rise apartment complex near its campus on Commonwealth Avenue into a dormitory unless it accepted the conditions. Conservation easements to protect open space along Lake Street and the orchard (which BC refers to as "buffer" space) to protect against future development. UPDATE: The final Globe story is here. Image of fabulous lettering by Caro Wallis provided through a Creative Commons license. Kairos Shen, the Chief City Planner of Boston and the Director of Planning at the Boston Redevelopment Authority, will be meeting with Brighton residents in order to discuss the path forward for Boston College's master plan following the close of the public comment period last Friday. Shen was named to the chief planner position in January 2008. Shen was recently profiled by the Boston Globe Magazine as the "Shaper of Things to Come." "I rely on him because I have total trust in his creativity and his judgment," [said Menino]. That, Menino adds, is why he named him chief planner, giving him the responsibility for determining where the city is going, what it needs, where it needs it, and how it's going to get there. Shen was involved a bit with the review process of Harvard University's Science Complex, now under construction in North Allston, by attending a few meetings -- but is becoming much more involved with Harvard's master planning process. This will be his first public meeting with Brighton residents on the BC review process. A petition with 438 signatures regarding Boston College's Institutional Master Plan was hand-delivered to Mayor Thomas Menino's office and sent to the Boston Redevelopment Authority last week; several additional sheets of signatures were delivered later, upping the signature count to roughly 500. Several other petitions were also circulating in the neighborhood -- including one organized by condo owners at a Commonwealth Avenue apartment building, and apparently another one (which I haven't seen) from the Jewish Orthodox community -- supporting many of the same points. The petitions were submitted as part of the public comment period that closed last Friday on the revised IMP that BC filed with the BRA in June 2008. The number of signatures expressing opposition to key elements of BC's master plan will likely raise eyebrows in Brighton -- and in City Hall, too. "I support Boston College housing 100% of its students. I do not agree with BC's proposed plan to house students on the Brighton Campus and in a 575 bed off-campus dormitory at 2000 Commonwealth Avenue. I support low impact athletic use on the lower Brighton Campus. I oppose the construction of a 1500 seat stadium on the Brighton Campus due to its impact on the neighborhood in terms of noise and additional traffic. I oppose the reconfiguration of the traffic patterns as proposed by Boston College without further study by an independent traffic consultant as requested by residents and Task Force members." I have seen many other public comment letters sent separately which make many or all of the same points, suggesting that the number of Brighton residents supporting these positions is significantly higher than the roughly 500 on these petitions. four residents of Glenmont Road. There were 186 people or organizations who wrote or signed petitions in February 2008 asking for BC to house all of its undergraduates on their main campus, so the new petitions substantially increases the number on this issue. 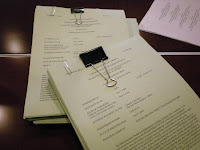 Comparing both sets of petitions (February vs. September 2008) shows that there is a substantial number of signers on only one or the other, indicating that the total number of Brighton residents who have signed their name to these positions on undergraduate housing is significantly higher than 500. It takes little analysis to figure out that a significant fraction of the people in owner-occupied residential property in Brighton have signed onto these petitions. Voting trends usually find higher turnout among such long-term residents than the so-called "transient" population, so I wouldn't be surprised if a number of elected officials in City Hall are taking careful note of these numbers. 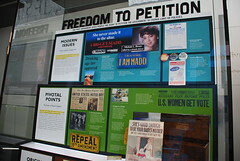 Image of The Interactive Museum of News by afagen provided through a Creative Commons license.